The current famine in Somalia was a disaster waiting to happen. Human suffering has been part of the history of Somalia; years of fighting between various war lords, violence and lack of governance have let this small country in the Horn of Africa sink to anarchy. Peace has been in steady decline since the outbreak of the Somali Civil War in 1991, when the Siad Barre regime was overthrown by rebels; since then, there has been no central government control over most of the country. A large part of the south of the country is controlled by the Al-Shabaab and the internationally-recognised Transitional Federal Government, headed by President Abdullahi Yusuf Ahmed, have control over only parts of the capital Mogadishu and some territories in the centre of the nation. They are working towards eventual national elections in 2012, when the interim government’s mandate expires. Al Shabaab is one of Africa’s most fearsome militant groups. The organisation controls much of southern Somalia, and has waged an insurgency against Somalia’s transitional government. Since 2006, Shabab leaders have claimed affiliation with Al Qaeda. The severe draught affecting the Horn of Africa region is akin to the last nail in the coffin, and the already war-ravaged country now represents the worst humanitarian disaster in the world. On 20 July, the United Nations (UN) officially declared a famine in two regions of southern Somalia, followed by three more regions on 3 August. This is the first time a famine has been declared by the UN in nearly 30 years. Preliminary figures suggest 3.7 million people are in crisis nationwide, of which 3.2 million need immediate life-saving assistance (2.8 million of this is in the southern part alone). With the current humanitarian response considered inadequate, it is expected that within the next 4-6 weeks the entire south region of Somalia will be declared “under famine”. It is estimated by OCHA (United Nations Office for the Coordination of Humanitarian Affairs) that the number of children acutely malnourished in Somalia is close to 390,000, of which 320,000 are in southern Somalia. The United States estimates drought and famine in Somalia have killed more than 29,000 children under the age of 5 in the last 90 days in southern Somalia alone. A major hamper to the delivery of aid in Somalia has been piracy, which has caused delay and diversion of the humanitarian cargo ships. Security issues are also hampering aid requirements. Since 6 August, Al-Shabaab has reportedly started withdrawing from Mogadishu, the capital city, for the first time in years, leaving the city entirely under the control of the government forces. However, the latest heart-breaking development confirmed by the WHO is that on top of the famine, now an outbreak of Cholera has been reported by the WHO with approximately 200 deaths reported in a single hospital in Mogadishu and many other smaller scale breakouts elsewhere. Approximately 1.46 million people are displaced, with Mogadishu hosting around 470,000 IDPs (internally displaced persons), out of which 100,000 have moved into the city over the past two months alone. 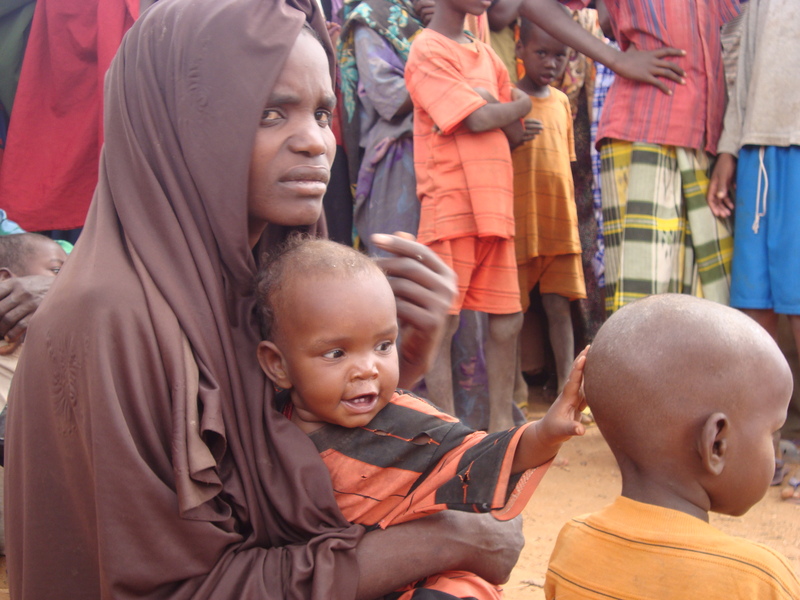 Moreover, displaced persons are crossing over into Kenya and Ethiopia at rates of 1,500 and 300 per day, respectively. Also, a shocking report by the Associated Press reveals that more than half of the food aid that is sent to Somalia is being stolen. While the United Nations World Food Programme has acknowledged for the first time that they have been investigating food thefts over the last two months, they reiterate that the “scale and intensity” of the famine is too severe to consider any suspension of aid into Somalia, as any halt to food aid would lead to “many unnecessary deaths”. For the past two weeks, planeloads of aid from the UN, Iran, Turkey, Kuwait and other countries have been arriving in Mogadishu almost daily. Boatloads are also on the way. Relief and aid efforts continue unabated. An Israeli aid group, IsraAID is partnering with the Canadian Jewish organizations UJA Federation of Greater Toronto and UIA Canada to bring food and water to suffering populations in Africa. Their relief efforts target Somalians who are crossing the border into Ethiopia and Kenya in order to escape the famine. The World Food Programme has started a series of nine airlifts to Mombasa in Kenya carrying high-energy biscuits to feed 1.6 million people for a day. Meanwhile, the Bahrain King Hamad has allocated $3 million on an emergency basis for the relief operations in Somalia. And in addition, a day-long campaign on 12th August was organized appealing to the public to pledge donations in cash and kind. On 15th August, China also promised a further $55 million for famine relief in the Horn of Africa. This is in addition to the $8 million pledged earlier. A UN list of countries donating aid money to the Horn of Africa famine shows that the US is by far the biggest donor, having given around $580 million in aid this year. The UN says the world community has given $1.1 billion in aid so far, but that $1.3 billion more is needed to help the more than 12 million people in need. Britain is the second-biggest donor at $205 million, followed by Japan and Australia. Saudi Arabia is next at $60 million and is also the biggest donor from the Muslim world. The Somalia operation as a whole has received $576.4 million since the beginning of this year, representing 47% of the required amount. A sizeable portion of this has come from donors. But there still exists a significant funding gap. But nothing will change on the ground unless Somalia’s governmental chaos ends. “As long as there is conflict in Somalia, we cannot effectively fight famine. More and more children will go hungry; more and more people will needlessly die,” said UN secretary-general Ban Ki Moon. Ugandan President Museveni has pledged to send an additional 2,000 Uganda Peoples Defence Forces (UPDF) soldiers to beef up security in the war torn region. Uganda already has 7,500 troops in Somalia. The offer comes a week after the Islamic militants, al Shabaab, withdrew from areas they held in the capital. The drought in the Horn of Africa is the first since a two-year regional drought from 2007 to 2009. During the last drought the number of people in need of humanitarian assistance was approximately 23 million at its peak in September 2009. Observers fear the current crisis in Somalia might get worse. Some even draw parallels to the Ethiopias famine in 1984, which claimed one million lives. With the world taking note and aid trickling in, one can only hope that the situation will improve fast enough to save the millions of lives at stake.